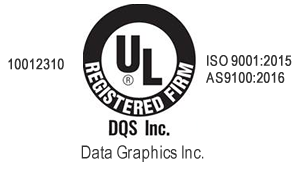 Polyimide Labels | Data Graphics Inc. Polyimide Labels | Data Graphics Inc. Extreme conditions call for an extreme material. When you’re looking for long lasting durability in a multitude of environments, look no further than Data Graphics polyimide labels. Polyimide labels are uniquely crafted from space age materials and substances. Data Graphics polyimide labels are designed and created to endure temperatures far beyond other labels. These labels are also known to be extremely flexible, durable, and resistant to impact and other types of trauma. Our polyimide labels are designed to last. Even if the product or material they are stuck to doesn’t last, our labels will. Our graphic overlays and polyimide labels may seem like a niche product, however, any business can benefit from them. As an example, you may have a unique piece of machinery or equipment that sits outside enduring all types of different, harsh conditions. No matter where you are located in the world, extreme weather conditions can occur. With our polyimide labels, you can have piece of mind knowing the labeling on your products will not endure physical wear that other labels may. 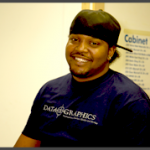 Data Graphics understands that your company may have its own graphics, colors, logo, and other information. We take pride in your information and want to create the perfect custom polyimide label. We can print your polyimide label with a variety of materials, finishes and colors. Contact Data Graphics today by getting in touch with one of our Sales Engineers or getting a quick quote today to learn more about our polyimide labels.